This morning the first footage from Geetu Mohandas' sophomore directorial feature Moothon dropped, and while it isn't much, it has definitely piqued our interest. Mohandas started her career as an actress in the Malayalam film industry, but her 2014 directorial debut Liar's Dice was India's official selection for Academy Awards consideration and we've kept a keen eye on her ever since. Moothon is an evolution of her Sundance Lab selected project, Insha'Allah, which has been in development for several years now. In the last year and a half she added a number of incredible talents to the production team, making Moothon one of the most hotly anticipated films of 2019 out of India. The film, a story of a young man searching for his mysterious older brother, was developed to be shot in two languages, Malayalam and Hindi. While Mohandas took care of the writing for the most part, she brought on Indian indie icon Anurag Kashyap to write the Hindi dialogue, raising the film's profile in international eyes. Add to that the keen eye of director of photography Rajeev Ravi, who has shot many of Kashyap's best known films (Gangs of Wasseypur, Dev.D, No Smoking) as well as a boatload of impressive features across multiple languages, and this film immediately jumps to the top of my must-see list. There isn't much detail as to the story available yet, but this brief teaser gives us a flavor of the visual tenor of Moothon as well as briefly introducing us to the main character. 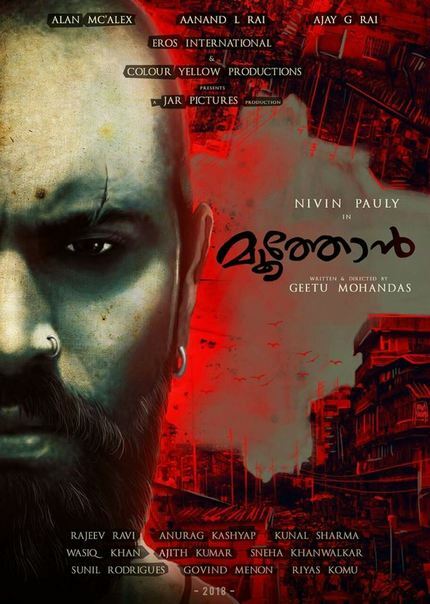 Moothon stars Malayalam film star Nivin Pauly and Hindi indie darling Shashank Arora (Titli) in leading roles with a number of other fantastic actors sprinkled in supporting roles. I've been tracking this one for quite some time and this footage, while not as all what I was expecting, is damned impressive on its own and definitely whets my appetite for more. No release date has yet been publicized for Moothon, but with Mohandas' background, I wouldn't be surprised if festivals were on the horizon for this intense looking feature.